We go through a LOT of these in the Denver heat! This is what I play for 90% of the show! Without this band and especially Bluey, I would not be where I am today… an enourmous thanks to Bluey for being there for me all of these years and for the support and love he has shown us all… here’s to the next 30 years!!! There was a tornado warning at one of our last shows in St Paul… it was insane… just before the intermission before high wire we heard a loud siren…. then the emergency lights went on and we were told to exit the big top immediately…. so before we know it we were all (artists, crew AND audience) being piled into a parking lot under a bridge which was across from where we perform… it was a crazy twilight zone moment… one second we were performing to a thousand people, next minute we were trapped under a bridge with them – sirens and police cars everywhere… nuts! This the kit I get to do a solo on every day…..ROCK!!! 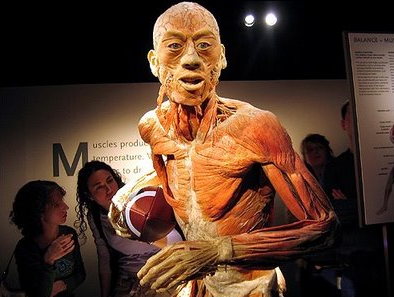 Went to see this exhibition called “Bodies” at the Mall of America…. at first I wasn’t sure how I would feel about seeing all these dead bodies and body parts…. but it was really mind blowing and gave me so much insight into the wonder which is our body that I can highly recommend it if it is in a town near you!